SI MUND T�I TREGOSH NJ� KANIBALI P�R DASHURIN�? N� faqet e k�tij libri, Don Ri�ardson rr�fen n� m�nyr� t� drejtp�rdrejt� rr�fimin e gjall� se si F�MIJA i Paqes i solli paqe t� v�rtet� m� s� fundi popullit Saui t� Guines� s� Re Hollandeze. Nga DonRi�ardson?, 164 faqe, botuar ne shqip nga Shtepia Botuese "Shigjeta"
? How can you tell a canibal about love? Through the pages of this book, Don Richardson recounts the true story about the Peace Child who at last brought real peace to the Saui people! 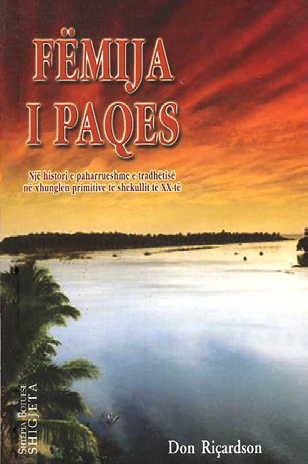 By DonRichardson?, 164 pages, published in Albanian by Shtepia Botuese "Shigjeta"